I knew I would love these little cocktail cookies. Every sushi bar should serve a couple of them as an amuse bouche, or alongside sake and beer. Savory-sweet cookies like these seaweed fleur de sel sables, mexican hot chocolate sables, chocolate cayenne cocktail cookies, and pistachio feta orange cocktail cookies should be set out on trays as complimentary happy hour bites, and offered at bars in place of those little bowls of cocktail nut mix. I'm all for replacing boring with interesting and unique. Dorie says patisseries all over Paris offer some version of classic sables with unclassic ad-ins like olives, cheese, bacon, cracked spices, or seasoned salt...because the salty cookies are "playful, chic, and attention-getting." They have my attention. I've gone through a half dozen just writing this first paragraph. Add addicting to the above description. Dorie credits David Lebovitz for the recipe. If by some chance you don't know him, David is a pastry chef, blogger, and cookbook author, living the sweet life in Paris. 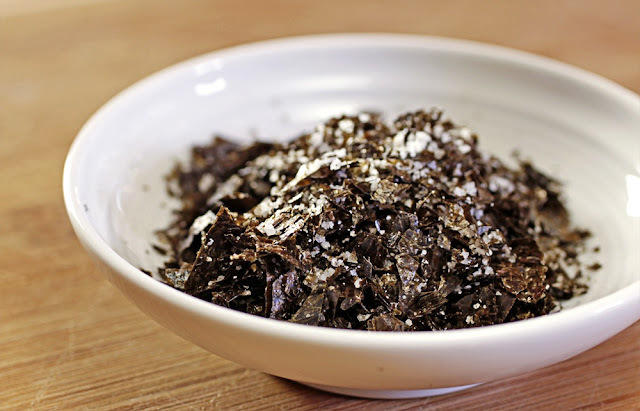 David uses fleur de sel aux algues (fleur de sel and seaweed already mixed together), which may not be easy to find, but it's simple enough to toast and finely chop nori, and mix it into fleur de sel. David cooks his cookies at 300 F and Dorie cooks hers at 350 F. I like them a little golden and crunchy, so I went with 350 F. Also, after reading about toasting nori, and the method for making nori chips, I decided to add a teaspoon of toasted sesame oil to my cookie dough for another layer of flavor. 1. 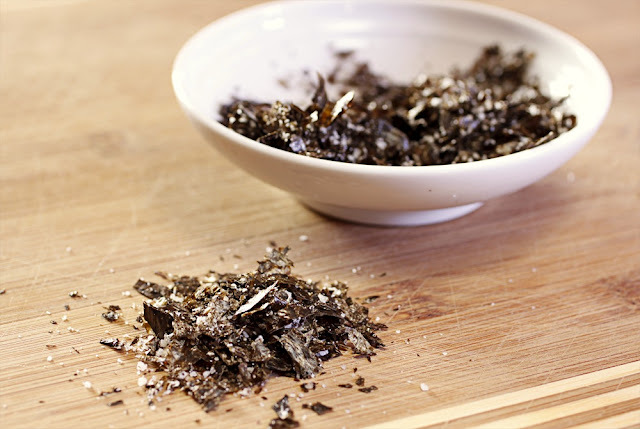 Toast the sheets of nori (see note and link below) and finely chop enough to yield 3 tablespoons. 2. 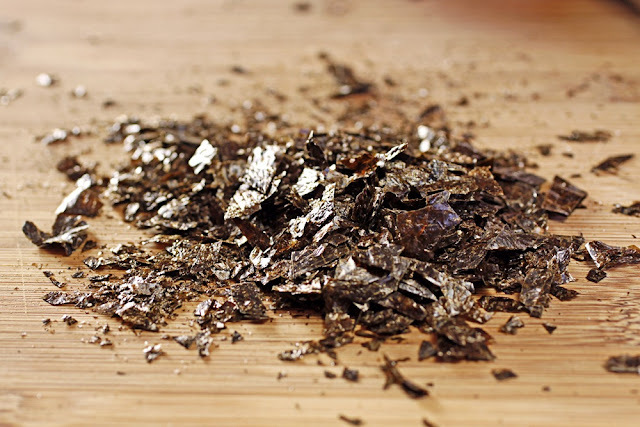 In a small bowl, mix the chopped nori with 1 teaspoon fleur de sel. 3. 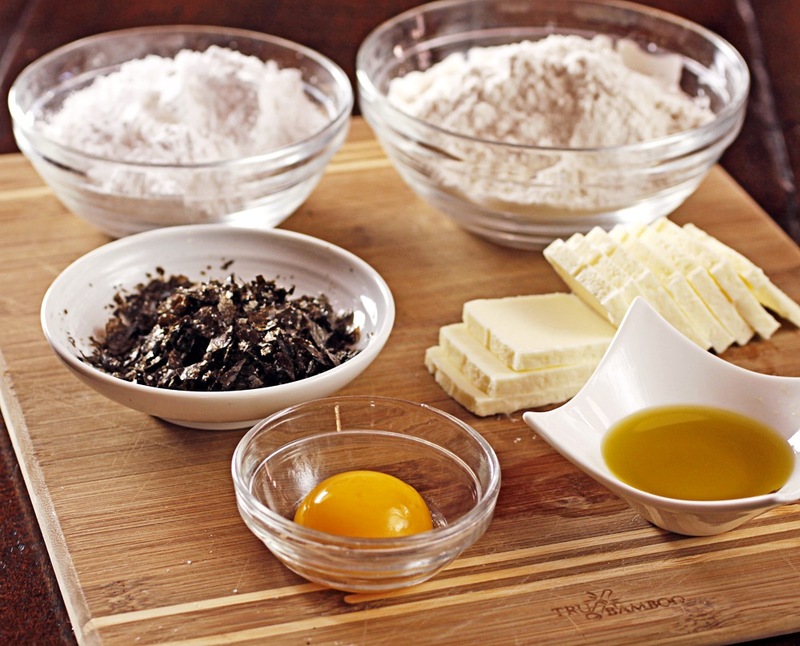 In the bowl of an electric mixer, or by hand, mix together butter, flour, fleur de sel and nori until smooth and creamy. 4. Mix in the powdered sugar, and then the egg yolk. 5. Add the olive oil, sesame oil, and flour, and mix until smooth. 6. 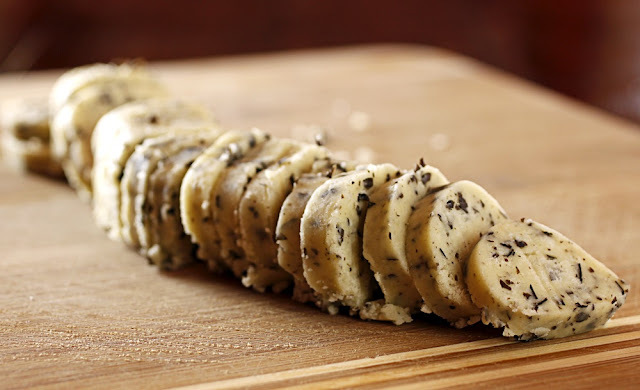 Divide the dough in half and roll each half into a log, about 6 inches long. 7. Wrap each log in plastic wrap and refrigerate until firm, at least one hour. 8. 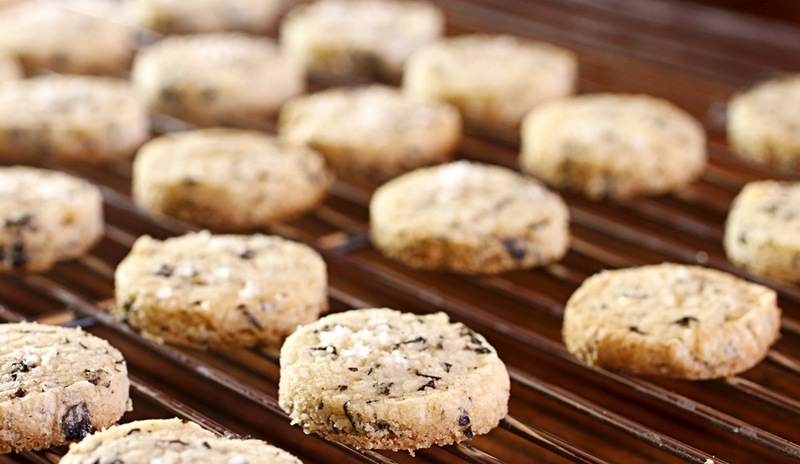 When ready to bake the cookies, preheat the oven to 350 F. Line a baking sheet with a silicone mat or parchment paper. Working with one log at a time, slice the cookies 1/4-inch thick. 9. 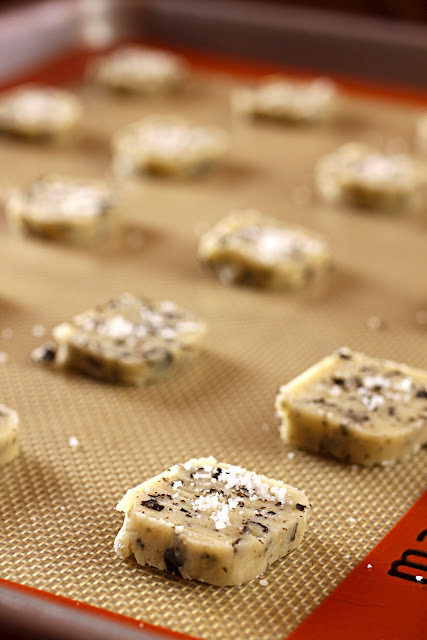 Place the cookies on the prepared baking sheet, leaving some space between them. 10. Sprinkle a couple of grains of fleur de sel over the top of each cookie and bake for 12-14 minutes, until lightly brown around the edges. 11. If you want perfectly round cookies, all the same size, use a small, round cookie cutter to cut immediately when they come out of the oven (you can then nibble on the scraps for a snack). *Full Disclosure: I am a member of Amazon Affiliates and receive an extremely small commission if you link to Amazon from There's a Newf in My Soup and purchase products from Amazon. You make them sound so good I feel like I missed out! I bought toasted nori but I wonder if it would have been good to toast it again at home? Well done! Beautiful post, Denise! 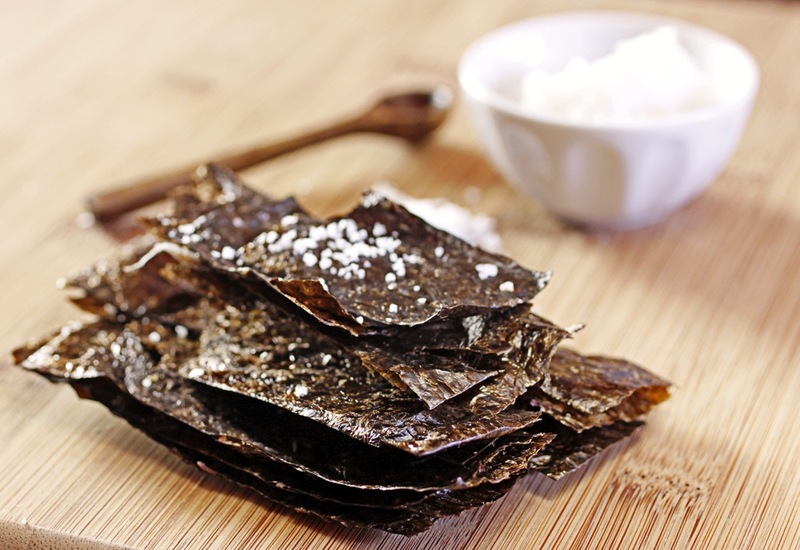 My husband likened the flavor to Japanese rice crackers, so I can see how they would fit right in with Sake. I'm glad we tried tnem. Your photos are stunning! Beautifully done, Denise. These would have been lovely as part of a pre-dinner coctail party. Gorgeous pics and lovely presentation. I'm happy to hear that you enjoyed these. I expected to like them, I do love salty snacks, but somehow these just didn't do it for me. I liked them as well but they were a tough sell to the others in my house. They enjoyed the one I made them eat but weren’t itching to take another which says something. Just not sure what. These photos are the best I've seen today! enjoyed them. I thought they were pretty good and I would like to try other variations on this sablé cookie. I love your bowl with the oil! We loved this at our house! Yes, these are so addicting! Beautiful photos! These are gorgeous and unusual. I've had seaweed butter in Brittany, but the idea of seaweed sablés is so exotic! I love the idea of pairing them with sake, too! Beautiful photos. Oh, Denise, it's Monday morning, I have a full and busy week ahead, and now I am feeling so damn guilty for dissing the seaweed sablés. While I loved the "idea" of them, I just didn't love the "them of them". I am interested, however, in your other cocktail fare recipes and am going to give them a look. Trying to redeem myself.